FSDP extended our global presence by standing in solidarity with our friends and advocates around the world to partner with Australia’s Family Drug Support to introduce the inaugural International Family Drug Support Day (IFSDS) to the US on February 24, 2017! Our loved ones are brothers and sisters, mothers and fathers and grandparents, employees, students, athletes, musicians, who also happen to use substances. The reality for many families is that there are limited programs and services available and many policies adversely affect families, all too often under a cloud of stigma and shame. FSDP community members held events in the Eastern and Southern US as well as in Bawahlpur Pakistan. Event venues and locations were very diverse, hosted and attended by families, drug users present and past, healthcare professionals, students, and treatment centers in FSDP members local communities. The message focused on the need to view substance use through a human rights and public health lens, rather than as a criminal justice issue, demanding informed and innovative policies and programs that reduce the likelihood of harm for our loved ones. and access the same best practices as experienced in every other medical and mental health condition. 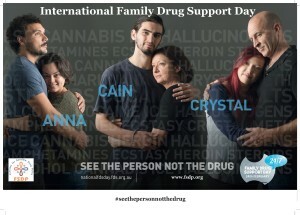 IFDSD will be held on on February 24 every year coinciding with the anniversary of the passing of Damien Trimingham, the son of Family Drug Support founder Tony Trimingham’s , founder, from a drug-related overdose. IFDSD will be an annual event to highlight the need for families impacted by substance us to not only be recognized and heard but to be supported and encouraged to speak about their concerns and their needs.